"The short focal distance Helitran model LT3-OM is ideal for optical microscopy with high numerical aperture. The sample to objective distance can be a few millimeters. The UHV construction permits less than 10-8 Torr vacuum at room temperature for minimum contamination of the surface." The cryostat on the left is a liquid helium cold cryostat for optical microscopy with adaptations for mounting and thermally anchoring a diamond anvil cell. 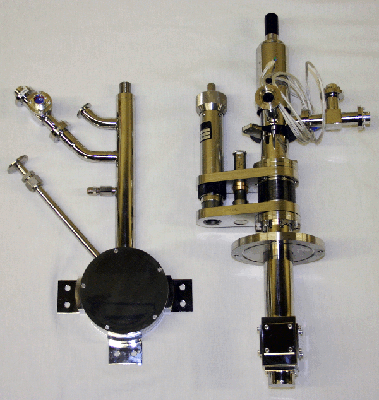 The one on the right is a liquid helium cooled cryostat for FTIR and THZ applications featuring a 10 mm CVD diamond window, spectrometer adapter flange, and Z-translator for three sample measurement.